How big do we want or need? How many people do we need to be able to sleep? Does the RV we’re looking at really sleep the number it claims to, comfortably? How much room do we have to store it when not in use? What types of places do we want to visit? Some campgrounds and resorts have maximum or minimum size limits. Some fancy ones only allow coaches, no trailers. What is our driving and parking skill level? Maintaining your good health requires some special consideration while driving long distances. Dress comfortably, preferable something loose so as not to constrict blood vessels. Drink water to stay hydrated, especially when traveling during hot weather or thru desert areas or high elevations. Consider eye drops if you are prone to dry eyes. Turbos are in basically every Diesel motorhome and possibly some gas models and need a bit of extra attention when it comes to cool down. Regularly checking and maintaining proper tire air pressure (along with proper loading and weight distribution) is extremely important to the safety and enjoyment of RV’ing. Improper air pressure in RV tires is probably one of the most common safety issues and causes for delays, extra expense and inconvenience on the road. Low tire pressure and overloading are the most common and can result in poor handling and braking, tire overheating, uneven tread wear and blow out and/or tread separation. Informative clip made by Michelin North America in conjunction with The Nevada Automotive Test Center. 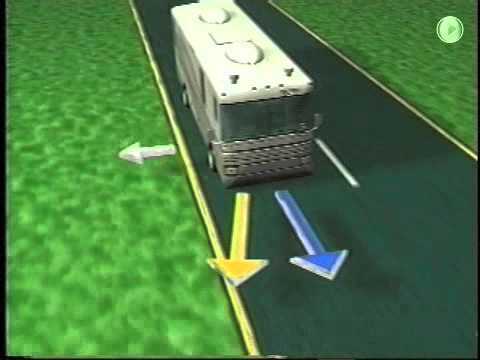 Shows how to handle tire blowouts on motorhomes.